It was indeed great to learn and inspect the visiting sites during the study tour. We were on four days study tour to Punatshangchu I and II at Wangdue, Memay Lakha waste Dumping site, water treatment plant, Agro Industry and Dechenling town planning in Thimphu. 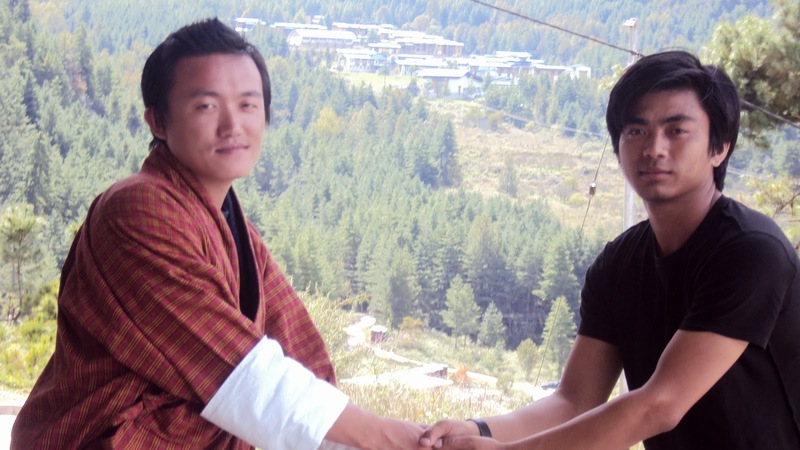 It was more fun taking photos with friends and enjoyed the journey to and fro in and around the town of Thimphu. The most valuable thing is something that we have gained and learned from the visiting sites. Visual experiences conflate with what we have learned will help us in at least know how things are executed in the field and manage for the better choice of where to join after our study. The photo taken below is above Serbithang waste treatment site. The construction of the plant was funded by JICA. Organic wastes from vegetable market are bought to the site and manufactured into manure which is purely organic. He is my friend Ugyen Phuntsho. He is well known as Shoalin. He is indeed fun loving and we veg out in the college. We had seen Royal Thimphu College for the first time and we were tempted to take snap keeping it as background for our style of unity as guest. For I find it doesn’t require the fact to intact that he is my guest to introduce as your guest friend. yea everything fine with me but still I couldn't fix the issue on my blog. Thank you for your interest to read my post and hope I can let you know by any means through facebook or by email.